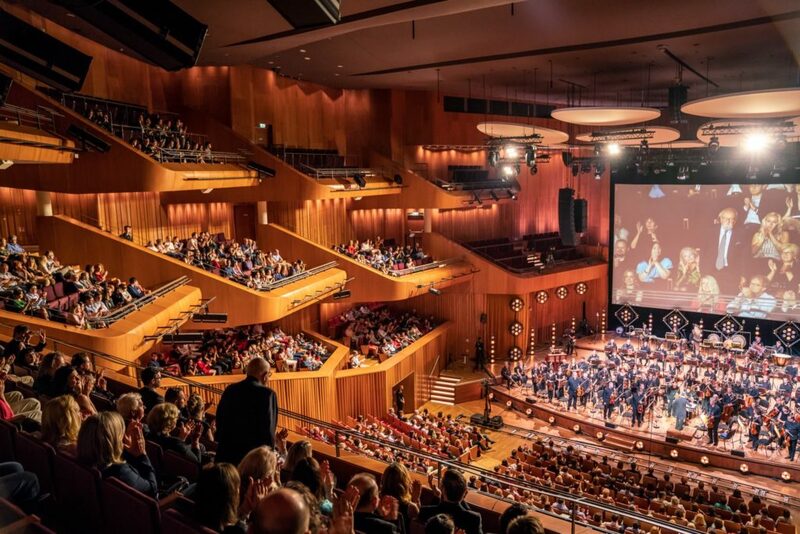 At the 2018 edition of the Film Music Festival in Krakow, Poland, we could enjoy two concerts in the ICE Conference Center, which were both with a Polish theme. The first one had its main focus on Polish composer Krzysztof Penderecki. The second one featured music from movies that were directed by Polish directors. This concert was performed twice. The first was in the neighboring city of Katowice and the second one in Krakow itself, which we attended. At this concert we could not only listen to Penderecki’s music but also to music from Michael Nyman – who won this year’s Kilar Award – and from a friend of the festival, Elliot Goldenthal. After the opening suite by Penderecki, we could listen to a suite from The Piano composed by Nyman, which was ironically performed without a piano. Sadly, Nyman himself was not able to attend this concert and receive his award in person. The piece itself was gorgeous, but secretly I was missing the piano a bit. 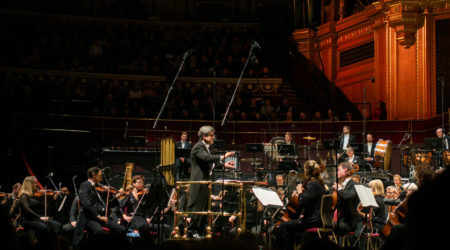 The first half ended with Elliot Goldenthal’s Concerto for Trumpet and Strings, which was dedicated to the Polish war hero Tadeusz Kościuszko. I was expecting some extremely difficult melodies written for the trumpet. We could, however, listen to long lines and rhythmic patterns, with the strings doing the same to lay a foundation for the trumpet player. The best way to describe this piece is that the trumpet player and the orchestra were telling a story together. The second half was completely filled with Penderecki’s music. Penderecki as a composer is very famous in and outside of Poland, and the hall the concert was held in was even named after him on that same day. Penderecki is not really a film music composer though. He has a quite a few scores under his belt, but his work is integrated into many movies and a number of composers, like Elliot Goldenthal, are influenced by his work. If you were not familiar with his music you were in for a huge surprise: His music is more experimental and unconventional than regular film music and contains lots of sound effects and patterns but almost no melodies. You could, for example, witness musicians tapping their bows on their music standards or tapping on their instruments. On the screen, scenes from the movies in which his music has been used were shown, like Shutter Island, Fearless and The Shining. I would be lying if I told you that I had a pleasant listening experience. I was, however, very intrigued by all the sounds the musicians were able to make and apparently I was not alone in this appreciation of musical skill since the standing ovation would not end. I would like to give my compliments to the organization for taking the risk of putting this nontraditional film music concert on the festival program. 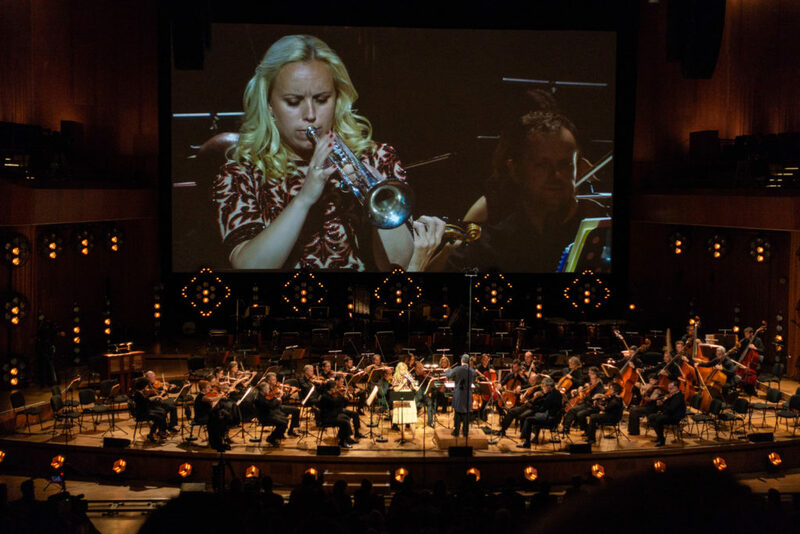 But also to Dirk Brossé as the conductor, to trumpet player Tine Thing Helseth and to all the other musicians who had to play this complex music. This concert with music from movies by Polish directors started with a suite from The Man with the Magic Box, composed by Sandro Di Stefano, which contained some lovely melodies. In the first half, we could also enjoy Loving Vincent by Clint Mansell, which was the same version we heard in Prague a month earlier, but the best pieces of the first half were the last two. 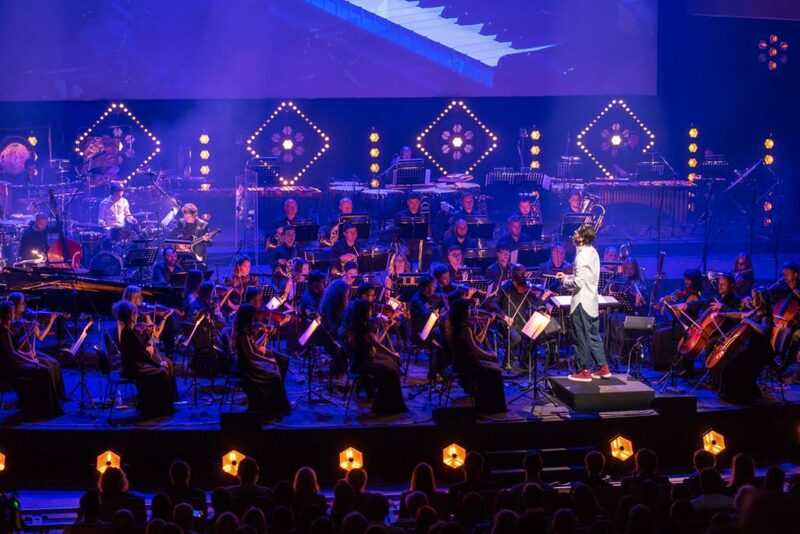 Composer JIMEK entered the stage in his white shirt and red shoes to conduct his own music from The Art of Love: The Story of Michalina Wislocka. In that piece the focus was on the jazzy relaxed music, which was played by a small band of musicians with the orchestra as support. The music was new to me and I found it very enjoyable. JIMEK’s second piece – a suite from Panic Attack – was also quite refreshing: it used a lot of percussion and had a long buildup with this percusssion and melodies laid on top to a spectacular finish. In the second half we could enjoy the music of movies from Polish director Agnieszka Holland, who was present for this concert. The half started and ended with music from her nephew Antoni Komasa-Łazarkiewicz. The first piece was from In Darkness and consisted of unnerving lines. The last piece, from the movie Spoor, was more interesting with a solo for violin that was amplified and a bit distorted in a way that I never had heard before. It was also fun to see the percussionists tapping on a pot and on a bottle of Dutch beer. One of the other pieces in this half was a lengthy suite from the three movies Total Eclipse, Washington Square and The Third Miracle with music written by Jan. A. P. Kaczmarek, which sounded very joyful and was a pleasant listening experience – especially the two parts with solo vocals. There was also music from an American TV series, where Jeff Beal appeared on screen to announce his House of Cards Fantasy since Agnieszka Holland has directed a couple of episodes. It contained the music from the series with a complex solo for flute laid on top of it, played by – friend of the festival – Sara Andon. Lastly, there were two themes written by Zbigniew Preisner from the movies Europa, Europa and Secret Garden. Overall, this concert was a delightful experience for me with all kinds of unknown music. It was quite interesting to see how popular Agnieszka Holland is in Poland: the audience could not stop clapping for her. I love concerts like this since they introduce me to an abundance of new information that I need to explore. I will start with JIMEK’s music since I was very impressed with his performance. What I also appreciated a lot was that this concert – but also the Penderecki2Cinema concert – was unamplified. 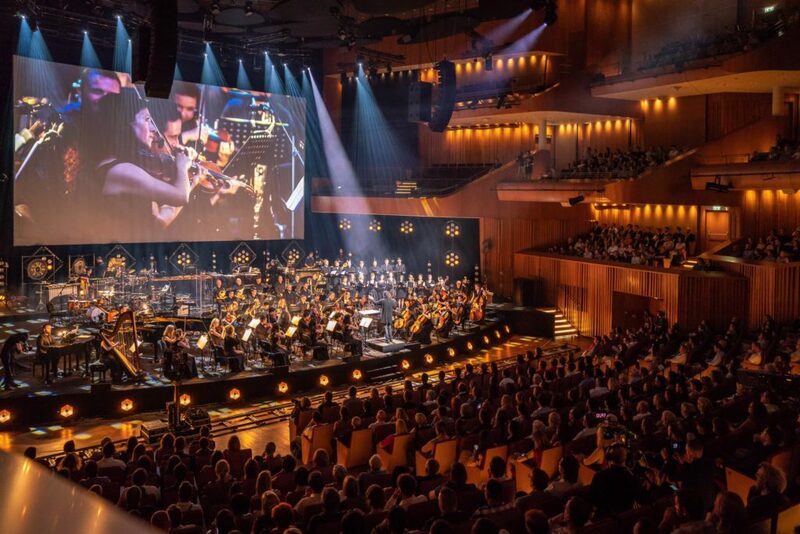 I mentioned the unnecessary amplification at the Abel Korzeniowski concert last year, and the listening experience was absolutely better this year since you could hear all the natural sounds of the musicians on stage.